Fresh air is one of the most important preconditions for life itself. However, all air contains pollutants, to different degrees, depending on time and place. Much is done to lower the emissions that make our outdoor air poor. Very little, however, is done to improve indoor air quality. This in spite of the fact that people in many parts of the world spend almost all their time inside. In Northern Europe, people spend as much as 90 percent of their time indoors. We feel better if we have clean air to breathe. We become more effective and perform better, whether it is at work, in school or at home. Also, as a number of studies have shown, the number of sick days taken go down with increasing air flows. So it should be a given for everyone to demand good air quality in all of our surroundings. The indoor air must not be still if it is to maintain a high quality. The whole idea of ventilation is to take away the stale air and replace it with fresh air. When air is moving too fast, however, people experience negative effects. Draft is, for many people, as big a problem as stale air. It is therefore important to be able to control the air velocities in well-ventilated rooms. In recent years, “dry air” has become a buzzword and many people ask for air humidifiers. We think that the air is too dry and the solution frequently becomes to add humidity. Very often the diagnosis dry air is wrong. Instead it is usually a question of too high a temperature or too many pollutants in the air. 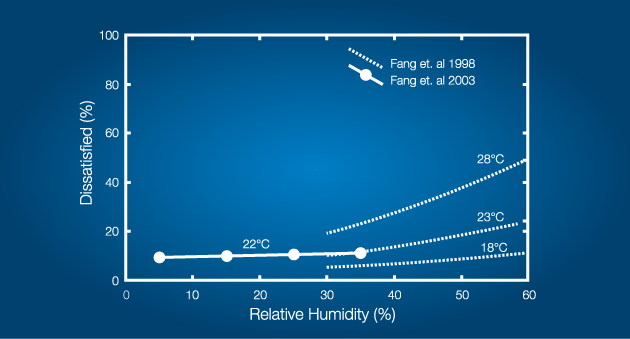 A lowering of the temperature gives a higher relative humidity. Therefore, the best thing to do when the air feels dry is to lower the temperature. The impact of humidity and temperature on perceived air quality expressed in percent dissatisfied is strong. Perception of clean air during whole-body exposure of persons to different levels of indoor air enthalpy (Fang et al., 1998a, 2003). The impact of humidity and temperature on perceived air quality expressed in percent dissatisfied is strong. Perception of clean air during whole-body exposure of persons to different levels of indoor air enthalpy (Fang et al., 1998a, 2003). Proper temperature during wintertime is 20-22°C, during summertime it is 22-24° C. There are many surveys that have shown that a temperature differential as little as a couple of degrees too high or low significantly decreases our performance. Not only is our effectiveness impacted but also our safety. Simply speaking, we get worse at doing what we do, our ability to think clearly goes down and our work result becomes totally different that if we had done it at better temperature conditions. If the environment is too warm, the ability to think clearly is diminished by 30-50 percent. The pollution of indoor air is the sum of pollutants from several different sources. Outdoor air that is not cleaned can get in, both through the ventilation system and through other openings in the building. Construction material and interiors can also emit pollutants. Surveys show that diseases such as lung cancer, asthma, and other lung disorders are more common among people who have lived in areas with high pollution levels. Increased fresh air volume and reduction of pollution sources give healthier people. This is an extract from our report "Raise the standards within Ventilation". Enjoyed this post? Read another one! 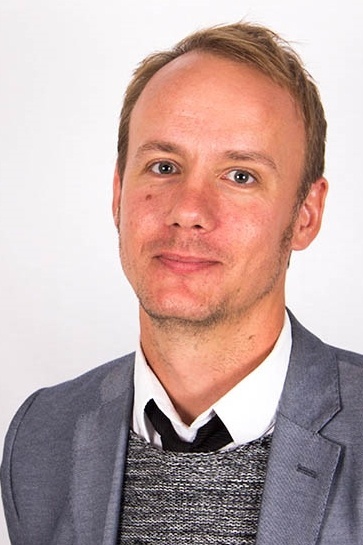 Johan is our Online Marketing Manager, responsible for most things digital at Lindab Group. Always looking for stories to share.